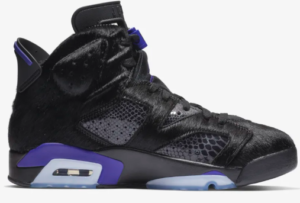 Air Jordan VI is a Michael Jordan’s sixth signature model. The shoe gained popularity after he won his first NBA Championship run in 1991. It’s the Black/Infrared Air Jordan VI he wore during the game. Over the years, the Air Jordan VI including the retro version have been released in different colourways. The shoes are not only fancied by basketball players, but also, sneakerheads, pop stars, celebrities, etc. There are many fans of Air Jordan VI all over the world. This new version features the upper with snakeskin pattern and cowhide. 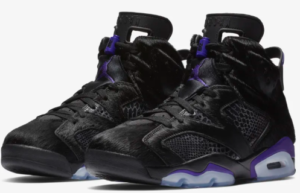 It also features animal fur overlay on the heel, side panel and toe box. As you can see, this Air Jordan VI version still stick to its root. The iconic air unit can be found in the heel. There is also a two-hole pull tab tongue for easy wearing. 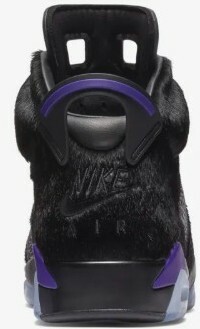 The “Nike Air” branding can be found on the heel and the insole. On the outsole is the Jumpman.